My deafie, Scotty, likes the water in his water bowl to be moving. An ordinary water bowl will be pawed at and splashed all over the kitchen several times a day. It drove me crazy, and then, I found the perfect solution...A Drinkwell Pet Fountain. We have had it for over 4 years and it's worked like a charm. No more water all over my kitchen floor. Today, however, the motor bit the dust. Actually, only the part that spins broke, but the unit was pretty crusted over with lime and calcium build up, so I decided it would be much simpler to replace the whole motor. 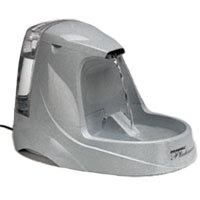 I discovered on my internet search for the new motor that the Drinkwell company makes a new Drinkwell Platinum Pet Fountain! Ohhh...Ahhhh....It holds more water than the old one, so there will be less frequent refills and the motor has a protective screen on it, so no more hair getting caught in the motor. Did I tell you about my friend who adopted a visually and hearing impaired Aussie? No, you hadn't told me! I assume its a double merle like my Scotty? I love finding items that make our daily routine easier; and finding an improved version at a great price - good job!! I don't know! He is mostly white with a little brown color. He has a great personality - though in a bit of a defiant stage right now. They are training him with body taps!